Hello, my dear friends! Summer is soon going to be over, the schools will be open (I don’t want to go back to school!) and autumn will change our lives… Anyway, remember last week I had shared with you this delicious tomato jam? I figured out a way to use it: I made a savoury cheesecake: a crust made of rusks, a cream with katiki (greek cream cheese)+feta scented with herbs and a tomato jam topping! 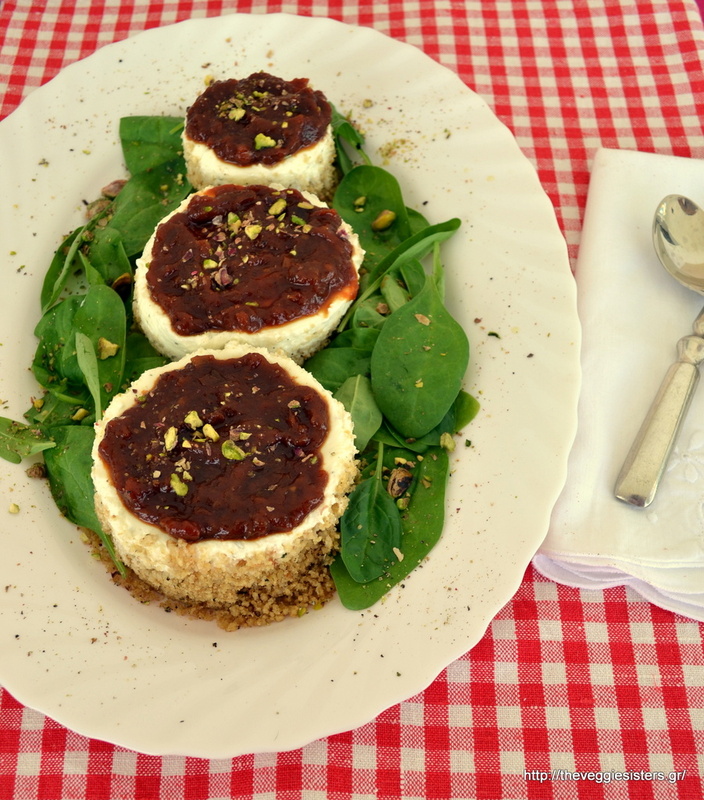 A heavenly combination of flavors, a refreshing appetiser that will please your taste buds! I used top regional products of Yoleni’s which brings the best greek products at our doorstep rightaway! Don’t forget that with every order that contains an olive oil, Yoleni’s has a yummy gift for you: you will be sent a package of «chiotiko kelari» lasagne chips! The only thing you have to do is use the promocode yvlaz14oil. Take care, my dear friends! Pulse all the crust ingredients in a blender. Divide the mixture into 3 cooking rings placed on a platter. Press the crust with your fingers. Refridgerate for 2 hours. Then blend the cream ingredients. Do not overblend because the cream will be runny. Divide the cream into the 3 rings and put in the fridge for another hour. 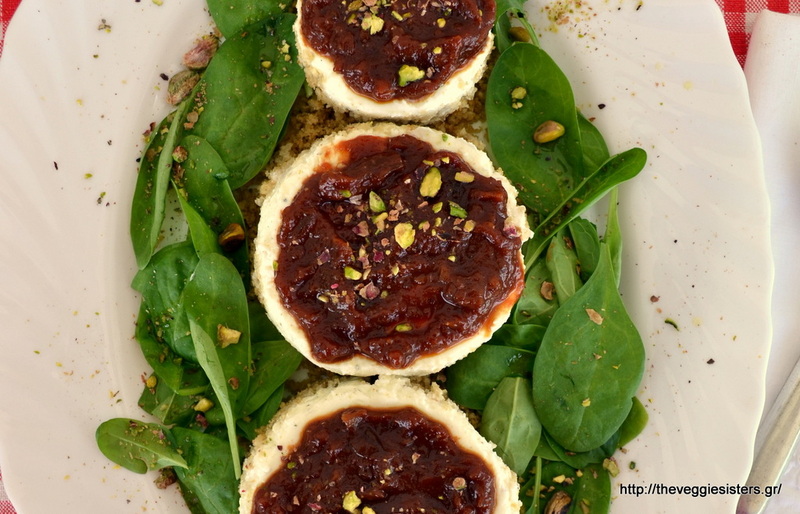 Before serving, remove cooking rings, spread tomato jam, top with pistachios and garnish with baby spinach leaves. Enjoy! 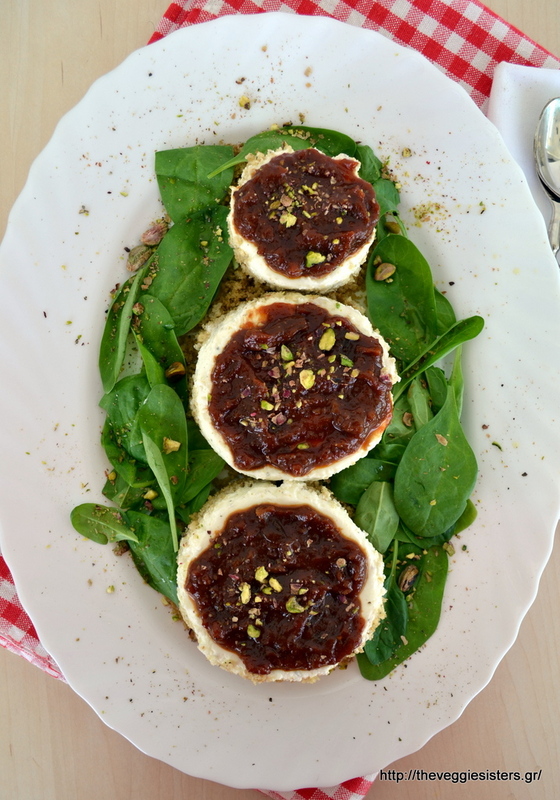 Share the post "Savoury cheesecake with rusks, herb scented cream cheese and tomato jam"